Scholars and policymakers have identified the primary causes of increasing wealth inequality—fewer good working-class jobs, a rise in finance-driven speculative capitalism, and a surge of tax policy decisions that benefit the ultra-rich, among other factors. However, they miss one commonplace but substantial contributor to the widening divide between the rich and the rest: the explosion of nearly invisible fees in key areas of people’s lives. 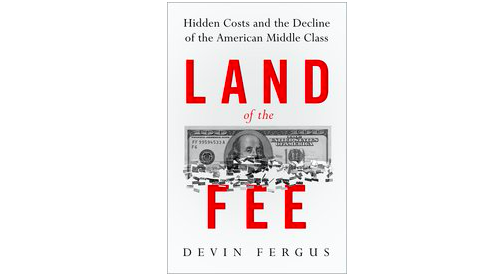 In Land of the Fee, Fergus explores how financial fees have made society less equal since the 1980s, what policies and policy makers have done to aggravate and remedy this disparity, and the impact of this gap on Americans in general and people of color in particular. Devin Fergus is the Arvarh E. Strickland Distinguished Professor of History, Black Studies, and Public Affairs at the University of Missouri. In 2018-19, he is the Visiting Professor at Northumbria University in Newcastle, UK. He is author of Land of the Fee (2018) and Liberalism, Black Power, and the Making of American Politics (2009), named a Choice Outstanding Academic Book in 2010. His work has appeared in the New York Times, Washington Post, Slate, and the Guardian. He received his PhD from Columbia University, and was a former Wilson Center Fellow.